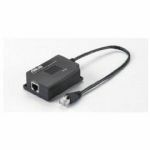 The DWL-P200 Power Over Ethernet (PoE) adapter is designed to supply operational power to surveillance cameras and wireless LAN devices such as access points, bridges and routers. 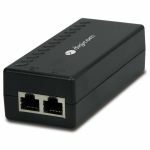 It enable power current to travel on the Ethernet network cable, thus eliminates the need to directly connect a power supply to the wireless LAN device. 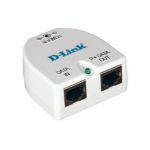 The DWL-P200 supports both 5VDC and 12VDC power requirements. Power requirement can be selected through a DIP switch. 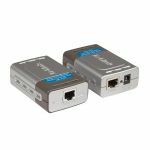 The Power Over Ethernet allows you to install the wireless LAN device and surveillance camera at places such as on a building rooftop, on or near a ceiling, or other difficult places where power is not easily accessible. The idea is increase the usefulness of your camera and wireless LAN to provide connectivity to users regardless of their proximity to a power outlet or a network cable. 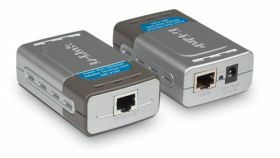 The DWL-P200 includes a base unit and a terminal unit. At one end, the base unit inserts DC voltage into the unused wires (pins 4, 5, 7 and 8) of the network cable. At the other end, the terminal unit splits the data and DC power apart. Data signals continue to travel on remaining network cables, while DC power is fed into the power adapter, which connects to an AC power outlet.